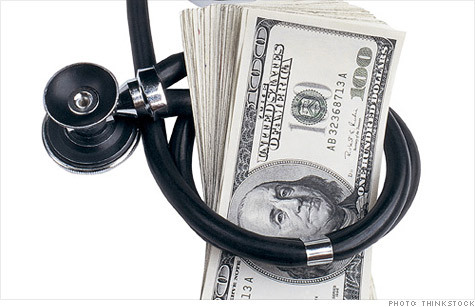 Feds level charges against a Dallas doctor for being part of the largest Medicare scheme. New York (CNNMoney) -- Dr. Jacques Roy, a Dallas area physician, allegedly led a scheme that bilked Medicare for nearly $375 million over five years, in the largest healthcare fraud committed in the United States, federal authorities announced Tuesday. Roy, 54, his office manager, and five owners of home health agencies, were arrested and indicted on charges related to their alleged participation in the scheme that involved fraudulent claims for home health services. According to the authorities, Roy owned and operated Medistat Group Associates, an association of healthcare providers, in the Dallas area. Medistat primarily performed patient home visits. Roy allegedly certified more than 11,000 patients with home health services in the past five years. Authorities said that the volume of certification was more than any other medical practice in the United States. It allegedly resulted in more than $350 million being fraudulently billed to Medicare, and more than $24 million fraudulently billed to Medicaid. "The conduct charged in this indictment represents the single largest fraud amount orchestrated by one doctor in the history of the Health Care Fraud Prevention & Enforcement Action Team and our Medicare Fraud Strike Force operations," said Deputy Attorney General James Cole in a statement. Roy's attorney Patrick McLain disputed that charge. "We're not sure how accurate this claim is," said McLain. McLain said authorities raided Roy's home and office in Texas last June and seized the records for 11,000 patients. "For eight months we were promised that we would get these records to prepare our case," said McLain. "We haven't got them yet." Authorities said Roy, a family physician, who was suspended from the Medicare program last June, allegedly performed unnecessary home visits and ordered unnecessary medical services. He also instructed Medistat employees to complete Medicare billing forms by either signing his name by hand or by using his electronic signature on the documents. Under the scheme, Roy's co-conspirators also allegedly used "recruiters" to bring Medicare beneficiaries to him so that he could fraudulently bill for unneeded services. In one case, authorities said a recruiter paid $50 each to Medicare beneficiaries who were recruited directly from a Dallas homeless shelter. "When a doctor accounts for one-third of the billing of a home health agency, he is an outlier," said Daniel Levinson, Inspector General with the Department for Health and Human Services. "We started looking at the evidence closely." Roy is being charged with one count of conspiracy to commit health care fraud and nine counts of substantive health care fraud. Each count carries a maximum penalty of 10 years in prison and a $250,000 fine. Also, 78 home health agencies that allegedly were participating in the scheme have been suspended from the Medicare program, authorities said. The indictment against Roy seeks forfeiture of the money in his bank accounts, as well as his sailboat, vehicles and multiple pieces of property. McLain said Roy still is licensed to practice medicine. "Dr. Roy was still seeing patients until his arrest yesterday morning," he said. McLain also clarified that Roy isn't forbidden from seeing Medicare patients, although Medicare has suspended all payments to him.